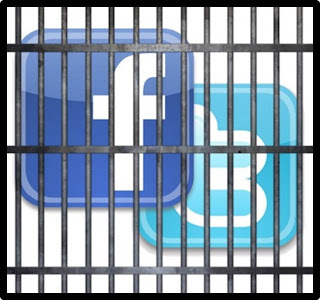 Marketing Tips 4 Authors - by Clive Eaton: What is "Social Media Jail"? At some point in your time on Twitter (or Facebook) you are likely to end up in a 'social media jail', without knowing why. So why does a post on 'Social Media Jail' feature on a marketing tips blog? The simple answer is that whilst you are being served prison food, and left feeling like a social outcast, your marketing machine is slowly grinding to a halt. Social media is very similar to a production facility in a factory – if the production line comes to a standstill, so too does the business . . . in your case, book sales. Marketing is all about getting the message out on a constant basis. Companies such as McDonalds, Coca-Cola, BMW etc., are all well-known global companies, but they too need to constantly market their product. So, if you do end up in a social media jail, you can’t be getting your message out. The first sentence you may face is with Twitter. There are two aspects here. The first is a short block from the system, based upon the transgression, and the other is suspension, which can last for several days. A short block occurs when one of the technical limitations is surpassed. Updates/Tweets: 1,000 per day. The daily update limit is further broken down into smaller limits for semi-hourly intervals. Retweets are counted as updates. Following (daily): Please note that this is a technical account limit only, and there are additional rules prohibiting aggressive following behavior. The technical follow limit is 1,000 per day. Suspension from Twitter occurs without any warning. One minute you can be using the system, the next you just get a message to say the account is suspended. Also, your followers will appear as ZERO! Don’t panic though, because if you successfully appeal the suspension then they will be re-instated, but you may lose a few. The biggest cause of a Twitter suspension is aggressive following, or using prohibited third-party software. The ‘guidelines’ Twitter provide are very ambiguous and don’t come with any true guidance. If they don’t like it, they’ll suspend the account. It can be best be likened to speed limits on the road. If you exceed the limit, you’ll get a possible ban. However, in Twitter’s case, they won’t tell you specifically what the ‘speed limit’ is, which isn’t particularly helpful. More details about Twitter’s rules can be found here. It seems Facebook also provides a similar ‘service’ to Twitter, and this happens when you ask too many people to be your friend. Again, limits aren’t made transparent, and if you try to befriend too many people in a short period of time, you could be serving a sentence of several days, or even weeks. In fact, the latest joke doing the rounds is that Facebook is an actual jail. You sit around, waste time, have a profile picture, write on walls and get poked by people you don’t really know. You have been warned! The ‘guidelines’ Twitter provide are very ambiguous and don’t come with any true guidance. Through keep reading, we can find all the information we may need. Anyway keep up the nice quality writing, it's rare to see a great. I am work as a data entry expert. But all the times clients are asking is you know social media marketing. But every times, i told themes no i don't. I you blog help me lot, can you tell me what is the basic of social media marketing. I am work on fiverr, so please take a look is every thing is ok or not.